On a cold January evening last month, a solo bagpiper stood on the stage, and performed a lament in front of hundreds of people. Some of the people listened, some chatted with their neighbors, and some continued to eat their haggis. The evening was Burns Night, a celebration of the life of the Scottish poet Robert Burns. The piper, my husband, played the long piobaireachd called the Lament for the Viscount of Dundee beautifully. This wasn’t the first time I’d witnessed Bob playing in front of a crowd. As the wife, of a Highland bagpiper, I’ve accompanied Bob to dozens of weddings, birthdays and funerals. Hiding behind the scenes, I have been a bystander at some of the most intimate and personal moments of complete strangers’ lives. I like going to weddings with Bob because they are blissful events and almost always are in pretty locations like Stanley, Idaho. Some of them are at rural countryside vineyards with beautiful views, or lush green city parks. 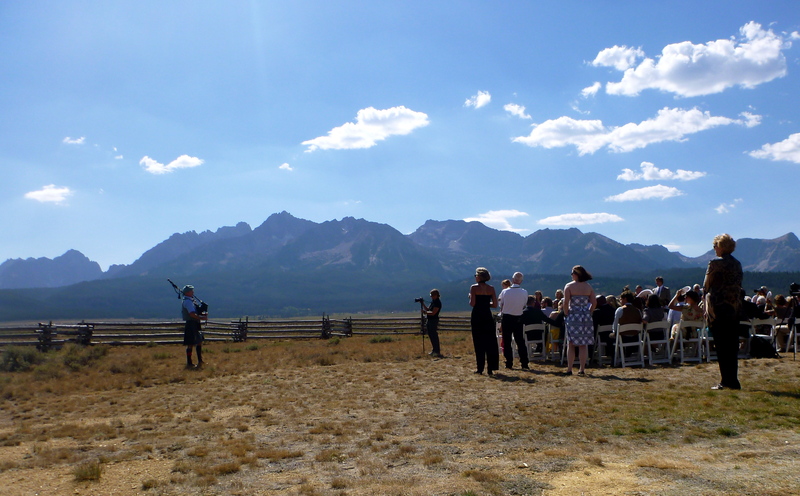 Almost ten years ago, a trio of bagpipers, played Amazing Grace at my own wedding, on top of Brundage Mountain in Idaho. Some people think that Amazing Grace is just for funerals, but it’s not. According to the Church of England, Amazing Grace is the number one song chosen by couples when planning their wedding services there. The tune is about transcendence. Stanley, Idaho with Sawtooth Mountains in the background. Surprise birthdays are exciting. Timing has to be perfect and the family will usually secretly call us while we are staked out in the car waiting. Once the call to duty comes in, Bob will usually start his performance outside to surprise the guest of honor before heading indoors. Margaret Franklin’s 90th birthday celebration was the birthday highlight last year. Born in Scotland, she loved her surprise bagpiper. I usually miss most of the indoor action but can still hear the music and people clapping while Bob performs. That makes me happy. 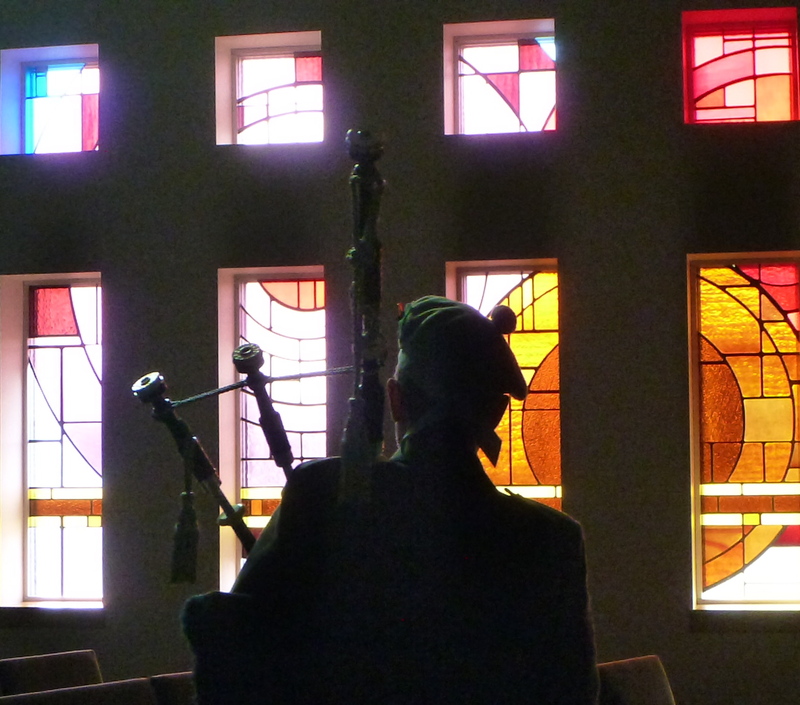 Bob warming up the bagpipes at the church. Most people don’t choose when they will die. Graveside services in the middle of the winter can be tough for a bagpiper. I watched Bob perform Amazing Grace on a cold windy day, barely able to keep his pipes in tune, and frozen fingers moving on his pipe chanter. Last year, my saddest memory was standing at a hilltop cemetery, with no shade, in 110 degree heat watching a family bury their 30-year-old son. While the family and friends arrived in their cars, the singer Adele played on a loudspeaker someone had set up. During the funeral service, Bob played Amazing Grace, and, when he was finished, some of the people dressed in their Sunday best clapped. It was an odd moment. I will probably continue to cry at funerals of complete strangers. Listening to Amazing Grace will do that to you. I used to enjoy listening to Adele sing but now she only brings me back to that hot, sad day. Today, I accompanied Bob to a memorial service for a 43-year-old who was a husband, father, and son. 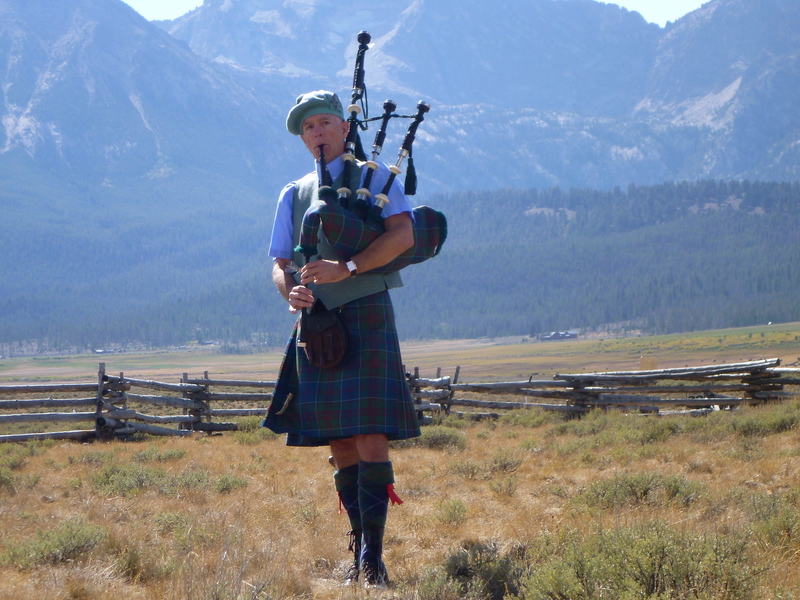 He had lost his short battle with cancer and the family didn’t want Amazing Grace played, only the song “Scotland the Brave” at the end of the service in honor of his courageous battle. I wasn’t in the mood to cry, so I’m glad that Bob wasn’t asked to play Amazing Grace. After the service, walking through the crowd of family and friends on the way out of the church doors, a couple of people quietly whispered, “Thank you” to Bob with tears in their eyes. I hadn’t planned to cry at this service. Leslie, this is a beautiful post. Thank you for sharing it. Amazing post. Makes me think about our wedding on top of Brundage with our friend playing the bagpipes, which was one of the best moments. To think of all the lives Bob (and you) have touched – whether sad or happy – wow. I’m sure they have just as fond of memories.
! Wow, we have a lot in common besides love of bicycles, a certain brand of clothing and now I find out we both got married to bagpipes on top of Brundage.